Do you need to get your RASP (Responsible Alcohol Seller Program) - alcohol seller / server training certificate ? Earn your North Carolina RASP (Responsible Alcohol Seller Program) - alcohol seller / server training certificate (commonly called: "North Carolina bartender license") by completing the Responsible Serving® of Alcohol Course for North Carolina. The Rserving® North Carolina Off-Premises Responsible Serving® of Alcohol Course has been approved by North Carolina Alcoholic Beverage Control Commission and fulfills the Responsible Alcohol Server / Seller training requirement in North Carolina. 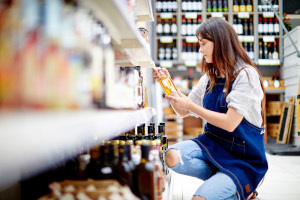 This North Carolina online server / seller training has been designed specifically for off-sale establishments such as grocery stores and convenience stores and will get you your alcohol seller certification for the State of North Carolina. Receive your official PSCC Rserving Responsible Serving® of Alcohol Wallet Card for NC Responsible Serving® of Alcohol in the mail! After you complete the course, you are able to generate your printable certificate for NC Responsible Serving® of Alcohol immediately. You will automatically receive your PSCC Rserving bartender's license / wallet card for NC in the mail within 15 days. What is the minimum age to sell/serve alcohol in North Carolina? The minimum age to sell and serve alcohol in North Carolina is 18. The agency that handles North Carolina liquor licensing and/or bartender licensing rules and regulations in North Carolina is The North Carolina Alcoholic Beverage Control Commission. The contact information for The North Carolina Alcoholic Beverage Control Commission is listed below. You can contact them to verify that online server certification (bartender license) can be obtained in North Carolina. We have also listed that information where applicable. NC Happy Hour Laws: The State of North Carolina has the following prohibitions on Happy Hours and Drink Specials: Drinks may not be offered for a reduced price on a specified day/time. Offering unlimited quantities of alcoholic beverages for a fixed price or at a fixed time is prohibited. No. You cannot have been convicted of a felony in 3 years or a misdemeanor alcohol or drug offense in 2 years.